Casa Limon Xalo is the lower floor of a privately owned substantial villa in an elevated and quiet position overlooking the Jalon Valley. The owners are able to offer the magnificent swimming pool and spacious terrace for the use of Casa Limon's guests absolutely and exclusively .. they do not use the pool and pool terrace at all while guests are in residence. 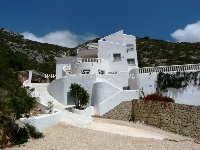 The owners live overseas and sometimes stay on the upper level of the villa and have separate living accommodation. When the owners are not in residence, Casa Limon's guests additionally have full use of the two upper terraces, one at the rear and one at the front of the property. 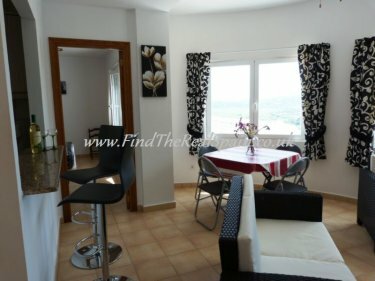 Casa Limon has 2 bedrooms, a large shower-room, fully fitted luxury kitchen and sitting room with dining area and satellite TV showing UK TV channels and Wi Fi internet. The property is light and airy, spacious, beautifully presented and furnished throughout in a contemporary style. Directly outside of Casa Limon is the fantastic free-form swimming pool of 10 x 5 metres with both roman steps and ladder. The spacious pool terrace is equipped with sunloungers, dining table, chairs, parasols and a BBQ. 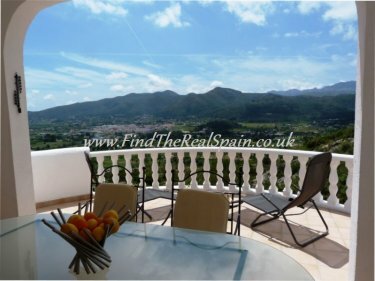 The view from here is glorious .. right across the Jalon Valley to the mountains of the Sierra Bernia. Casa Limon is a great choice for one or two couples or the small family offering fantastic pool/outdoor facilities rarely found at this price. Rental includes linen and towels and mid term linen and towel change for stays of 2 weeks plus. Pool/beach towels are provided. Jalon town is a 5-minute drive with a superb choice of restaurants, bars, shops, coffee bars, excellent supermarket and bakeries, and famous Saturday morning riverside market. Jalon Valley rustic restaurants are within a 10-minute drive radius offering excellent food with lots of choice at good prices. Choice of large supermarkets are a 10-minute drive at Benissa. Beaches and resorts of Calpe, Moraira, Javea and Denia are within a 20 minute drive. Best airports are Alicante and Valencia - 60 minutes and 75 minutes by car. 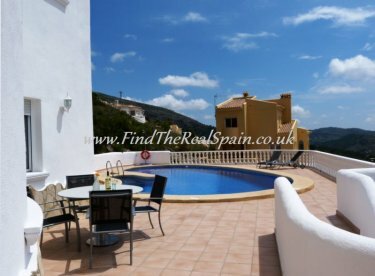 We think this villa apartment in the Jalon Valley is ideal for the couple or small family who want an exclusive pool and poolside facilities without a private villa price-tag (and what a pool!). The views are magnificent from the property and Jalon town's amenities are just a few minutes' drive or 15 minute walk down the hill.